Do you feel like you NEED to work out on vacation? Are you worried about gaining weight or some kind of unwanted body change? I just came back from an awesome trip to Minnesota. I used to live there so, I have many friends that I like to reconnect with. It was super fun and carefree. Many years ago, my head would have been consumed with thoughts of “Oh I don’t want to go backwards, I don’t want to get soft, gain weight, I need to make sure I get my workout in” or whatever else. I really couldn’t enjoy my life. Whether I was home, on a trip or whatever-I was constantly worried about the state of my body. Why was I consumed with these thoughts when I should have been enjoying my trip? Well…if you’ve been following the blog at all, you already know the answer. It always comes back to…. My worth being on my body. My lack of understanding of how body change actually worked. Plus, if you’re concerned about body change, the number one thing to keep in mind is how you eat. And cardiovascular exercise should be used. So, the point being, if you’re strength training regularly and you go on vacation, as long as you’re eating pretty reasonably there is no reason to think that you would gain weight. If we’re just talking science, the priority should be eating anyways. But, still who wants to go on vacation and be worried about the state of their freaking body anyways?! Thoughts of your body don’t need to CONSUME your vacation. I exercised a little this trip…because I WANTED TO. Friday was absolutely beautiful, so I walked for an hour outside around the city. But, I didn’t have any structured workouts…I was too busy having a great time with my friends! This felt so great and really enhanced my life….the walk and the fact that I wasn’t obsessed. Again, I was obsessed back in the day because my worthiness was on my body. And no amount of science/efficiency is going to get rid of this fact…unless you deal with the underlying drivers. No matter how much science or efficiency we bring into this (those things are great and we need them, but they are just pieces) we still need to get to the underlying reasons why we feel the way we do. Seriously, we are all more than bodies. And until we come to terms with this, and really start living and breathing from this place, this constant state of body worry will haunt us. This is of course easier said than done because we have so many cultural messages being thrown as us. But, this is why the Brainy Betties learn how to deal with these messages and uncover their true value. I explained to her how it’s personal training but also an educational program to help make women Fit AND Happy forever. Yes, exactly! Thank you Anna!!! This is why, unless you deal with your underlying relationship with your body and yourself, it’s very hard to have a healthy, happy relationship with food, exercise, vacation, or anything else. How we think drives how we live. Get your mind right. Click here if you want to be fit, but not have it control your life! 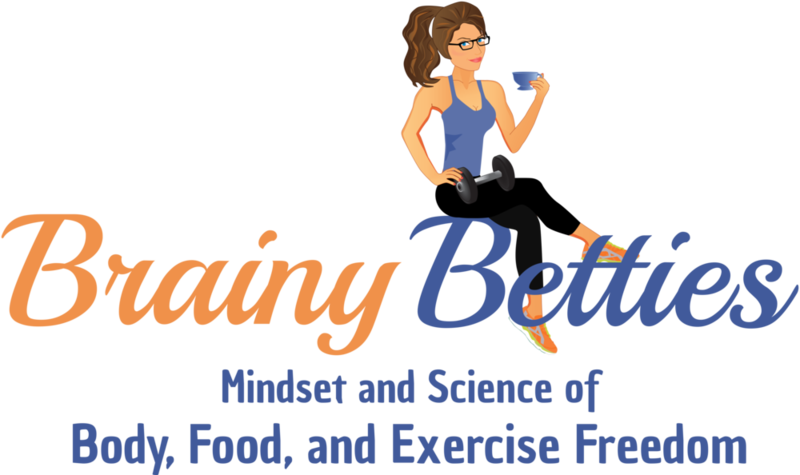 Get the Brainy Blog in your inbox!.